Are There Advantages to Being a Faith-Based Nonprofit? What Is a Faith-Based Nonprofit? A reader asked: "I am helping a new non-profit organization get started. In the course of our discussions, they said they are contemplating becoming a "faith-based" nonprofit vs. a non-faith based one. Is there any difference in these two designations? What are the benefits and disadvantages?" I asked Emily Chan, a San Francisco-based nonprofit attorney, to explain the differences between faith-based nonprofits and regular nonprofits. 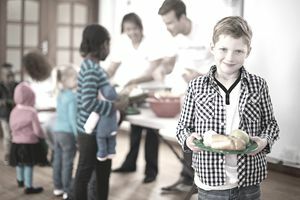 A Faith-based organization (FBO) is not a legal term, but it often refers to religious groups and other charitable organizations affiliated with a religious group. A collaboration of organizations that explicitly includes organizations from the previous categories. Thus, the decision to be an FBO may depend more on whether the primary purpose or activities of the organization are religious or religiously motivated than on any advantages or disadvantages associated with such a label. If the primary purpose and activities of the organization are not religious, but religiously motivated, the organization may want to consider the pro and cons of identifying itself as an FBO and a particular type of FBO, such as a church or religious corporation. Perhaps the primary considerations for identifying as faith-based revolve around how that designation affects donors, funders, supporters, beneficiaries, and other stakeholders. There are no direct legal benefits associated with being identified as an FBO. However, there are advantages and drawbacks related to being a particular type of FBO. For example, churches that meet the requirements of Section 501(c)(3) of the Internal Revenue Code can claim tax-exemption without a determination from the Internal Revenue Service (IRS). Churches have the option of applying for 501(c)(3) exemption or not. Even when they don't apply, they are automatically considered to be exempt for tax purposes. Churches and other FBOs enjoy special protections that limit how and when the IRS may audit them. Also, certain religious organizations, including churches, are exempt from filing IRS Form 990 and may be exempt from filing state information returns and charitable solicitation registrations. Can FBOs Receive Grants From Foundations? FBOs may not be eligible to receive grants from foundations or corporations that do not want to advance or be associated with any particular religion or religious purpose. However, FBOs that do not promote a belief in a specific faith may be eligible for grants if they are 501(c)(3)s. FBOs that are not IRS designated 501(c)(3)s will likely not be able to receive grants. Foundations are usually limited to making grants only to 501(c)(3) charities. The Arizona Grantmakers Forum noted that "information on foundation and corporate funding of faith-based organizations is limited." The best resource is the Roundtable on Religion and Social Welfare Policy, which is a research project of The Rockefeller Institute of Government. One study of large private and community foundations suggests that a substantial percentage (12%) expressed interest in funding both social services and religiously affiliated organizations. An examination of the grants issued by the 50 largest "faith-friendly" foundations indicates they provided $68.8 million to support faith-based social services in 1999 and 2000. That represented around 3% of the total annual philanthropic giving for these foundations. Little is known about the giving patterns of smaller foundations, but it is likely that their grants to faith-based organizations are significant. Many foundations target particular social services and fund projects whether or not they are provided by an FBO. FBOs are referenced in several laws that recognize their eligibility to receive grants under certain specified conditions and their continued right to consider religion when hiring staff. Charitable Choice laws, signed by former President Clinton during 1996-2000, specify that FBOs cannot be excluded from the competition for federal funds just because they are religious. But they do not set aside funds specifically for FBOs. In general, Federal grant funds may not be used for inherently religious activities such as worship, prayer, proselytizing, or devotional Bible study. The funds are to be used for the objectives established by Congress such as creating the conditions for economic growth and prosperity. Note: This article is just for informational purposes. It is not intended to be legal advice. Check other sources, such as the IRS, and consult with legal counsel or an accountant.